This game was made for the 2018 48-hour Toronto Game Jam TO Jam. It is a 2-player air hockey game where the objective is to score on your own net. 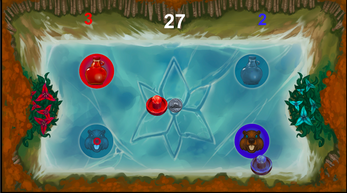 You can each power 2 power ups: beaver dam and maple syrup. Beaver dam blocks your opponent from scoring on their own net for 3 seconds, maple syrup slows their movement for 3 seconds. Spacebar rotates between splash screen, game and reset. Hope you have as much fun playing as we had making it!